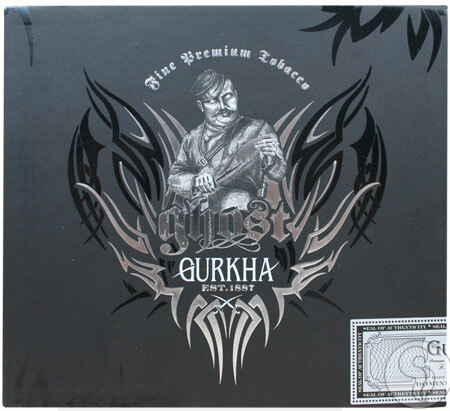 Ask average Joe Sixpack cigar enthusiast for a list of his favorite Gurkha cigars and 9 out of 10 times you'll have the Gurkha Ghost either high, or at the top of said list! For starters, as much as you'd like to tell yourself that looks don't matter, they often do play a role, at least subconsciously (sorry to get Freudian on you). And few will deny the Gurkha Ghost is one of the slickest-looking smokes of the modern era... holographic bands, flat black packaging, and stark black and white tubos... it's tough to deny. Of course, the cigar's stats don't end with the appearance—Gurkha has partnered with Abe Flores and his talented team of artisans at the PDR Cigars factory in the Dominican Republic for production. The Ghost begins with a unique Brazilian Arapiraca Maduro wrapper, which is secured over a Dominican Criollo '98 binder and fillers of Nicaraguan and Dominican tobaccos. The flavor profile is rich, medium to full-bodied, and easily enjoyable, with loads of black pepper, baker's cocoa, black licorice, nutmeg, and buttered sourdough toast.